Periodic “cross brushing” of the turf can help restore its aesthetic appearance. “Cross brushing” means that all brushing activity takes place against the grain, nap, or sweep of the turf fibers. By brushing against the turf, the fibers are “fluffed up.” Always use a brush with synthetic bristles – never use a brush with metal or wire bristles, because they can inadvertently damage the fibers. Rain is the best and cheapest cleaner. Otherwise, a quick rinse with a hose will wash off any lightly soiled areas. For heavier soiled areas, mop with a 3% solution of ammonia in hot water. Afterwards, rinse thoroughly with warm water. Remember, it is infinitely easier to clean up a fresh spill than to remove a stubborn stain once it has dried and set in. Excess liquids can be blotted up with paper towels, a clean cloth, or a dry absorbent, such as kitty litter or fuller’s earth. Dry absorbents can then be swept or vacuumed up afterwards. Always allow solid pet waste to dry and then dispose. Hose down the area regularly to promote the drainage of urine as well as to keep the surface hygienic and unsoiled. 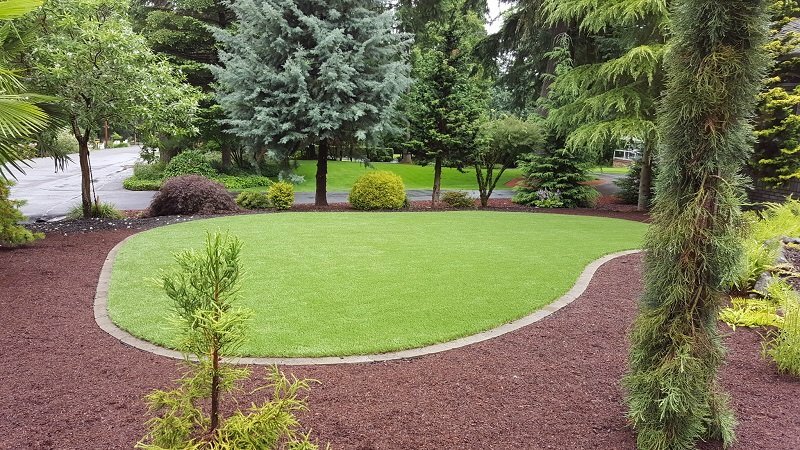 See more maintenance tips at http://www.synlawn.com/do-it-yourself/care-and-maintenance/. Contact us today and we’ll be happy to answer your questions!